Don’t be intimidated by the fact that it’s Colombia. A lot of tourists worry that Colombia isn’t safe. They have heard all the stories about Pablo Escobar and the Cali cartel and they are worried that they will be kidnapped and disappear forever! 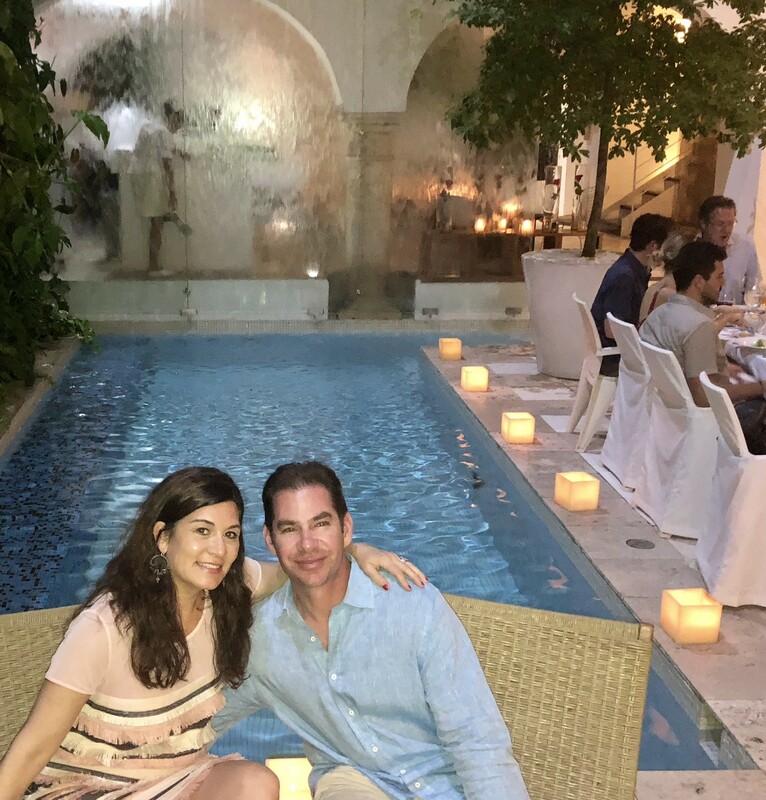 I can’t make you any guarantees, but Cartagena felt very safe to us. When my husband was doing his own thing, I walked around alone, I shopped alone, and I took taxis alone. Pro-tip- Travel from the airport — Yellow taxis are fine. A lot of tourists (us included) feel the need to use the hotel transfer when they first arrive to the airport. Not necessary. 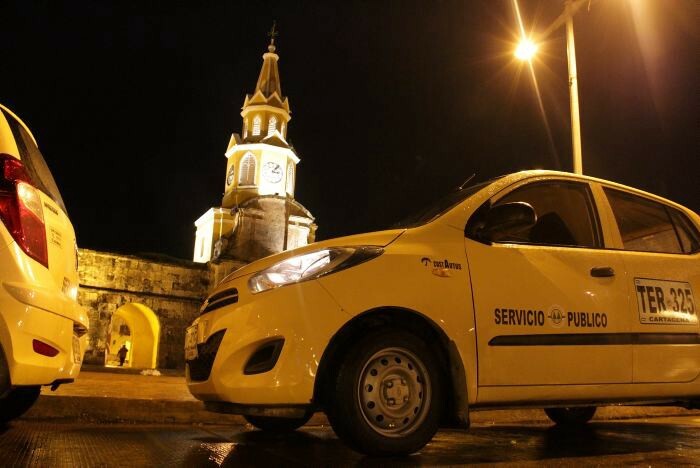 You can get into the yellow cab for $6 instead of paying the $30 for transport, not to worry. Exploring the Walled City. 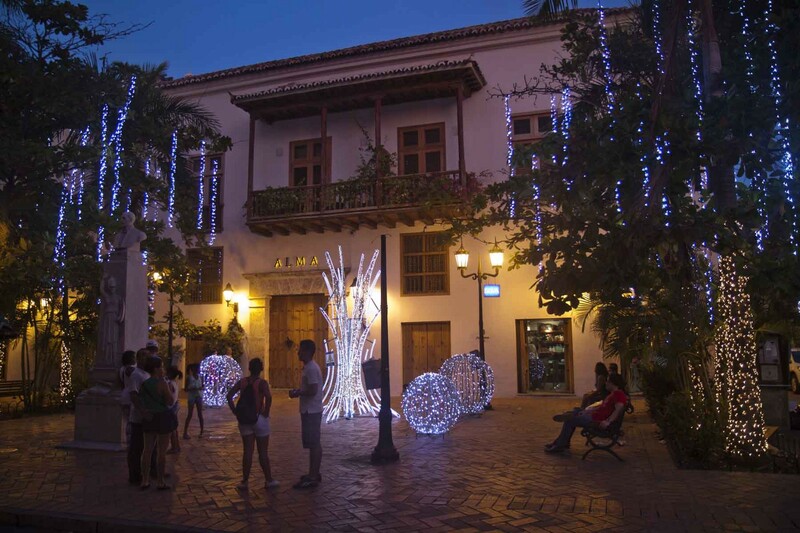 The Walled City (the old town) is the beat of Cartagena. The city is actually inside a wall that was constructed in 1796. Once inside, it feels a bit like a maze and it’s very easy to get lost, but getting lost was fun. Carta is a mixture of old and new- The Walled City and Bocagrande. I recommend staying in both areas while you are in town. Maison Tcherassi. 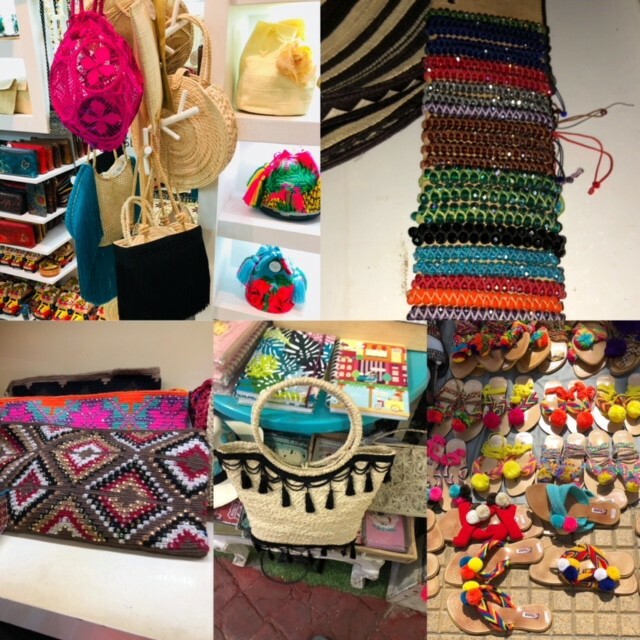 Sylvia Tcherassi, the owner is definitely a fixture in Cartagena. Not only does she have one of the most stylish stores in town (see below), but she also has 2 hotel properties right around the corner from each other. If you want privacy, we loved Maison Tcherassi. It has just 6 rooms but feels like a sprawling chateaux. 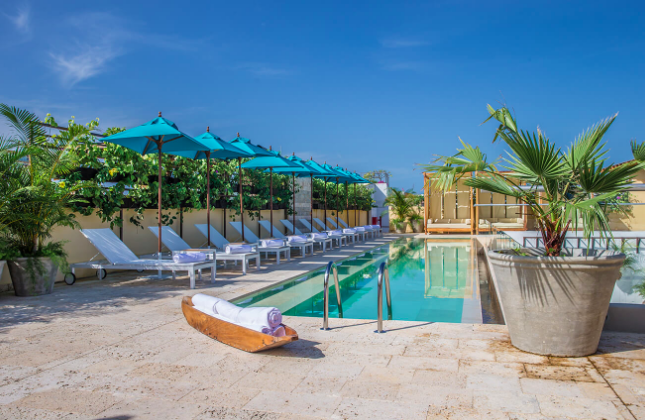 There are plunge pools in every corner for private swimming a deux and the rooms are stylishly designed all by Sylvia herself. Many of the accessories throughout the hotel are for sale in the hotel’s stylish boutique. There is also trendy restaurant Vera which is always crowded and fun. Vera serves high-end italian food in a beautiful setting. Some of my favorites where the Spaghetti Sylvie and the Corbina a la Carta. The main Tcherassi property has chic suites that meander all over the hotel. The suites have comfortable beds, a modern sitting area and a large bathroom with twin sinks, a bathtub and a shower. The feel of the rooms are modern and cool but also plush and romantic. 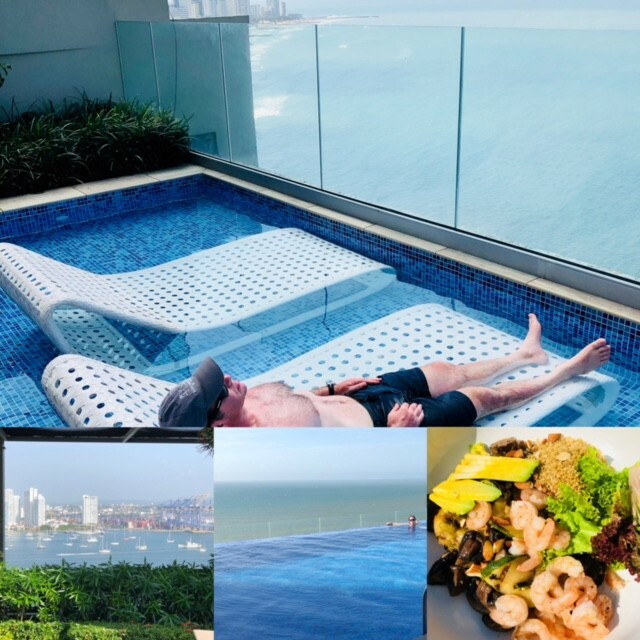 They also have an infinity pool on the roof along with a yummy restaurant called Matilda. 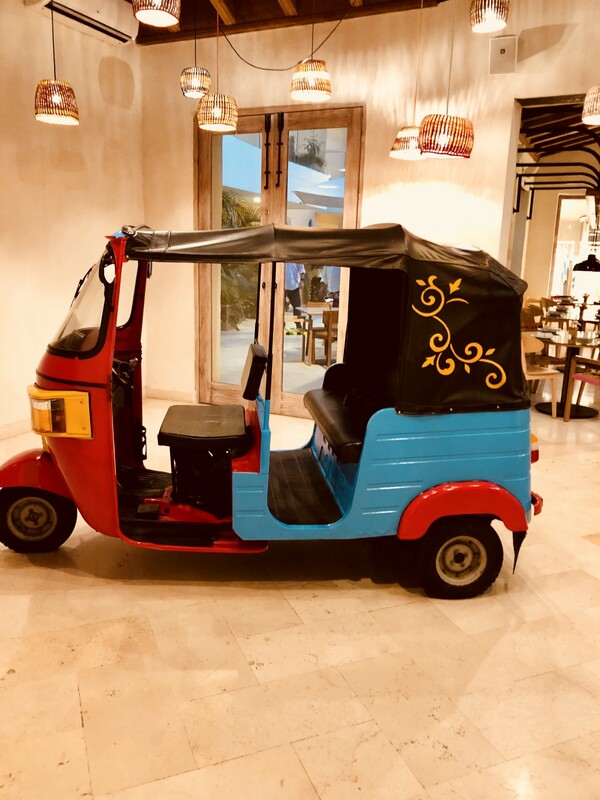 And then in the lobby, there is a unique restaurant called Tuc Tuc that offers street food from all over the world. Casa Pestagua, a Relais Chateaux property. 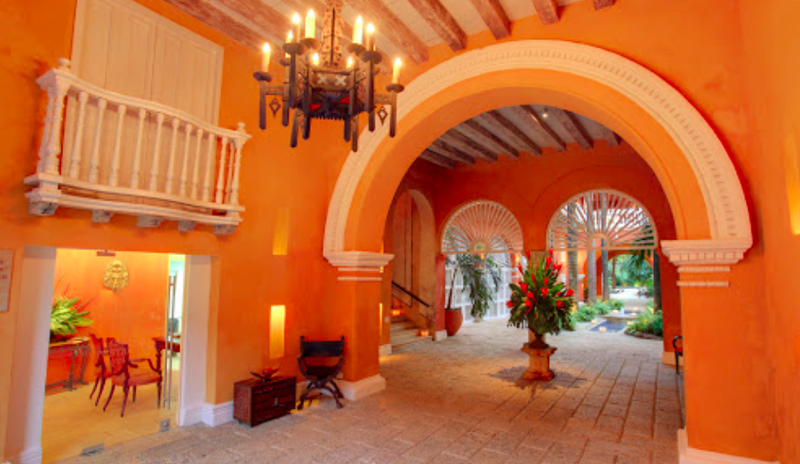 It is built into the most ornate mansion in all of Cartagena. It has a very old world romantic feel to it. 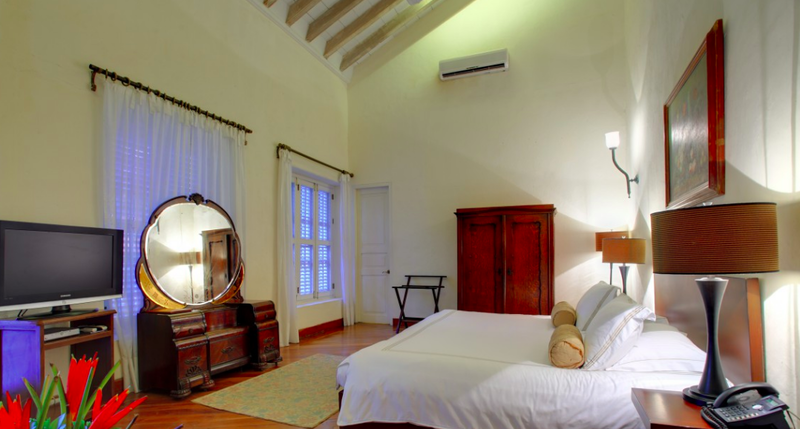 The rooms have antique furnishings, but they also have 600 thread count sheets and strong air conditioning. There is a lovely pool in the courtyard that actually gets shade (a plus in the hot weather) as well as a hot tub on the roof for those romantic soaking sunsets. And the food was quite good — a gigantic breakfast menu, gourmet Colombian food for lunch and dinner. Tres romantic. Hyatt Regency We found that the Hyatt was only luxury accommodation in Bocagrande. Bocagrande is about 5 to 7 minutes from the Walled City and couldn’t be more different. While the Walled City seems like Jerusalem or Dubrovnik, Bocagrande seems like Miami Beach or Atlantic City; the contrast between old and new is remarkable. 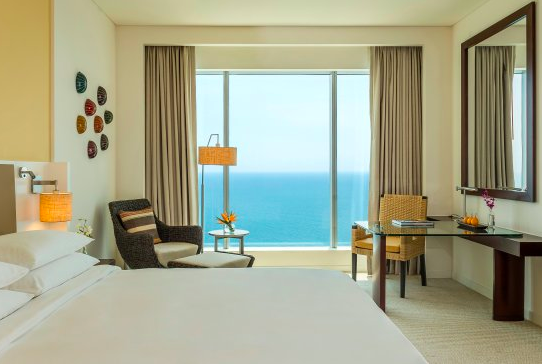 We found that it was nice to get out of the Walled City for a few days and be near the sea The Hyatt was built a year ago so it feels new, chic and minimalist. 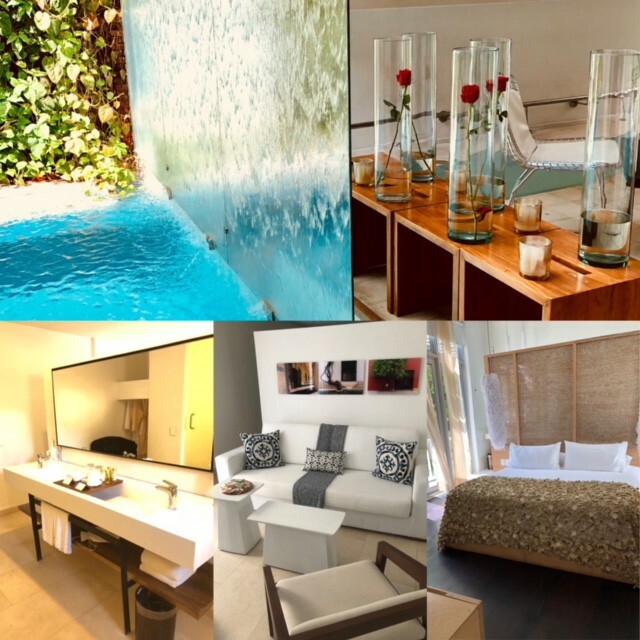 The room are large and modern, tons of air conditioning and have a minimalist mid-century modern decor. The lobby is high décor and the pools are quite lovely overlooking the sea. 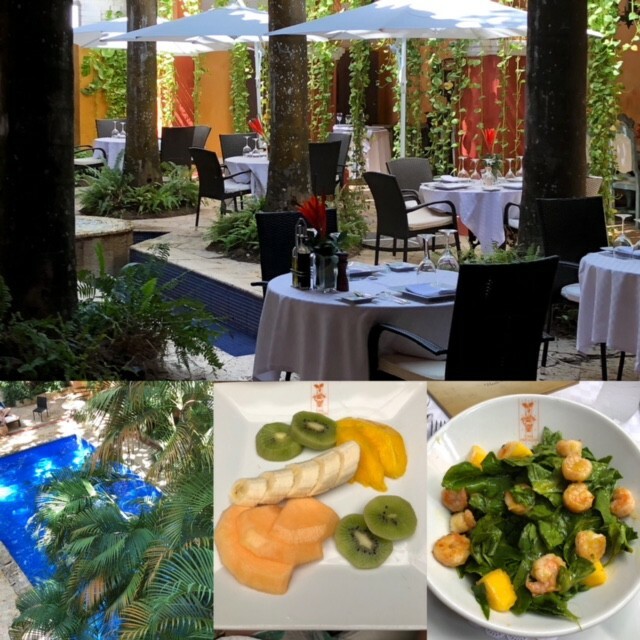 Also, the breakfast buffet was plentiful, the lunch poolside was very tasty and dinner was fun and original Other hotels (we explored them all) in Bocagrande like the Intercontinental and the Hilton were dated and tacky in comparison. Pro-tip: Keep in mind, that the 5 star ones are really more like US 4 stars, but their charm makes up for what they lack in service. We did find it frustrating how little the people who worked on the hotels spoke English. Have google translate on speed dial. There are endless restaurants in the Walled City, each more charming and tasty than the next. 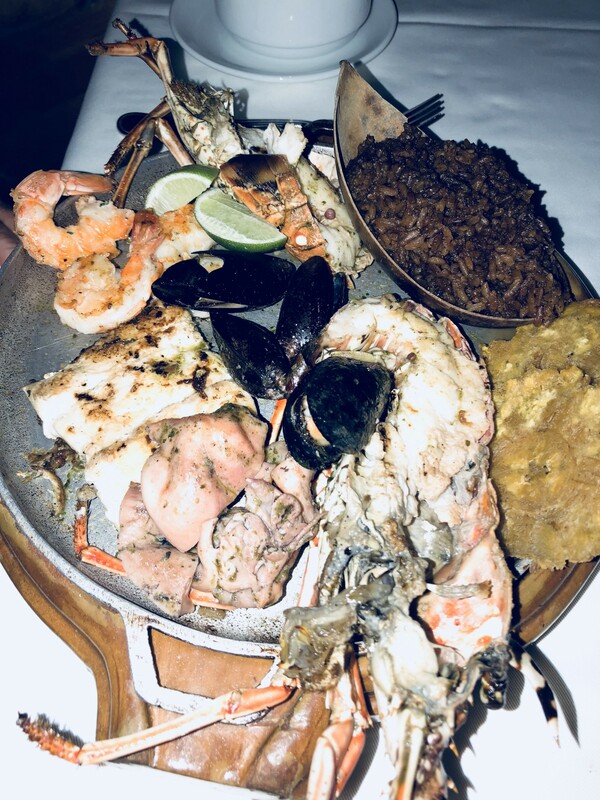 The 3 food staples in Cartagena are Ceviche which is an absolute must try everywhere, Corbina fish (Sea bass) and Paella with coconut rice, fish and seafood. We had 3 favorite restaurants, some honorable mentions and several not worth the hype. Alma at the San Augustin Hotel. The restaurant was very pretty and the food was REALLY good (think NY- good in taste and presentation). It also had a fun and lively band going all night. I could have eaten there many times. Some food standouts were the lobster thermidor and the seafood medley. Don’t miss dessert. La Latina Gastrobar for romance. This is a tiny restaurant near Plaza San Diego. It is related to La Langosta, a Carta lobster institution. 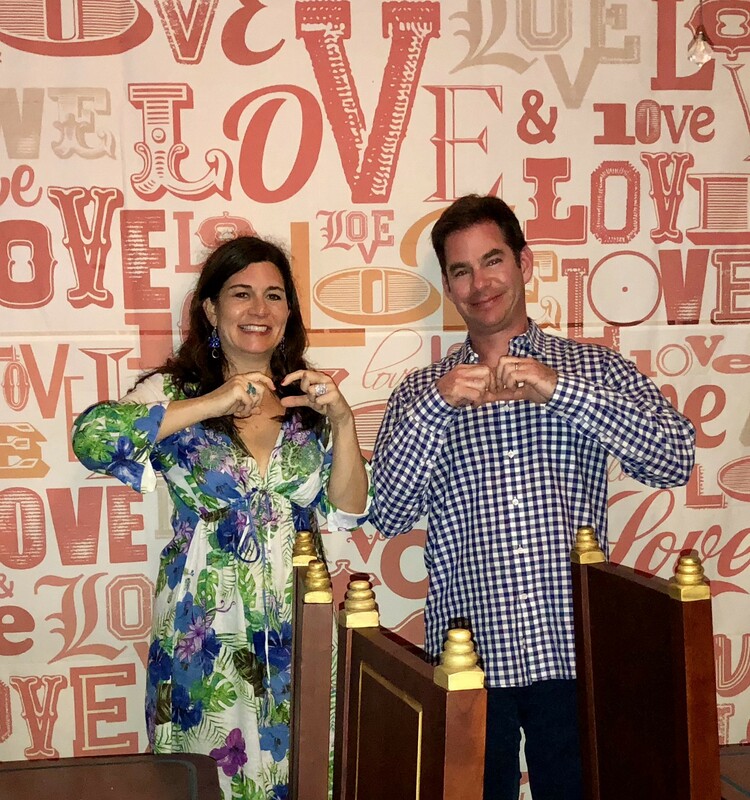 The moment you enter the restaurant it feels romantic from the entrance wall that is covered with the word “love” to the everchanging color Love sculpture on the roof where you eat. This is the place to get lobster and paella. Both were excellent. Club de Pesca. 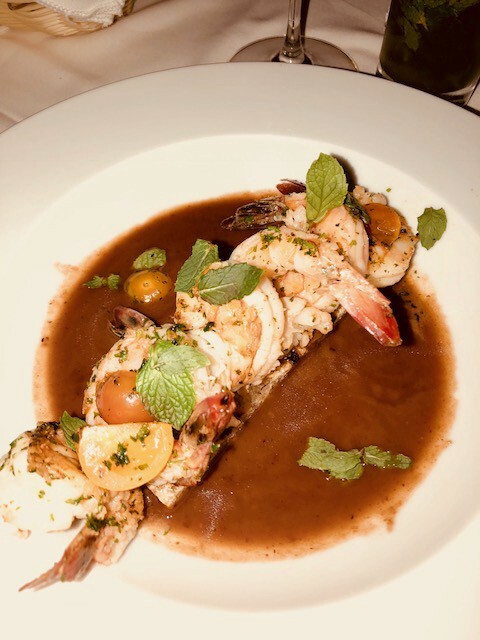 We were dropped off there by boat, sat outside staring at the lights of the old city and we ate one of the best seafood medley plates we had all trip. This is a fun and very popular place to go for sure. Pro-tip: El Baron a chic bar/nightclub with outdoor tables. We spent NYE there which proved to be an excellent choice as they set it up like a NY lounge full of couches, group tables, live music, and mean Mojitos and Moscow Mules. Pro-tip- At sunset, Tasca Bar. El Baluarte or the rooftop of the Movich hotel are the places to go. Definitely take the time to do it. Shopping in Carta is really good. 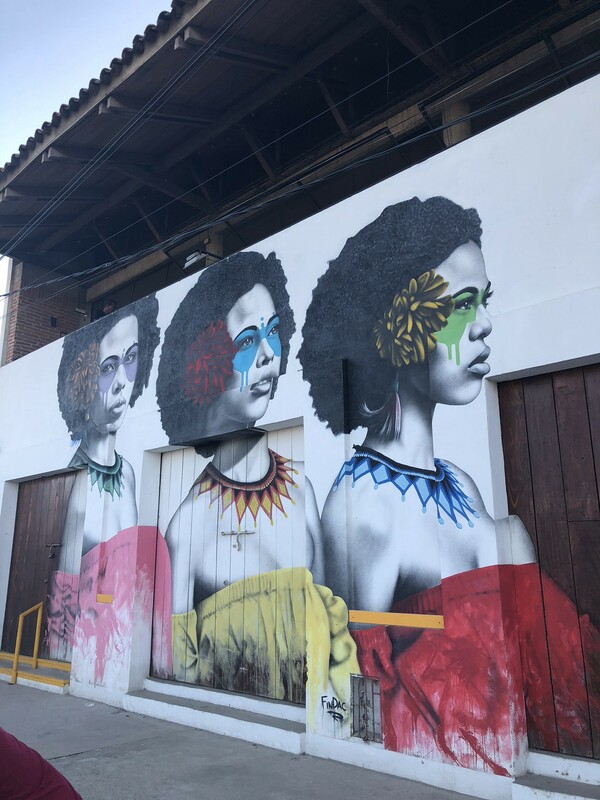 There are many stores that have high fashion items made by Colombian designers of whom we have never heard, but who have their pulse on fashion and design. 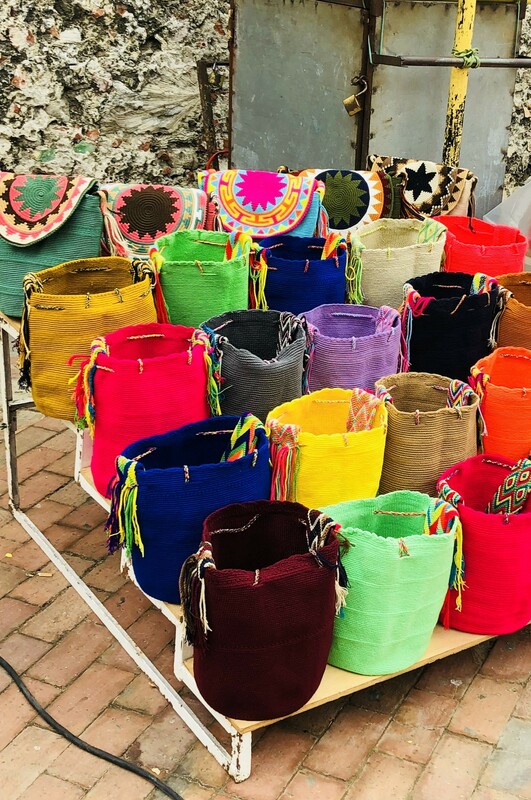 Additionally, there are endless vendors who sell Colombian feedbags in all sorts of wonderful colors and designs. Everyone winds up buying one (or 6 like me!) The ones sold on the street look almost identical to the ones you will find in the fancier stores at a fraction of the cost. (We paid between $25-$35 a bag (Sesenta or Setenta mil pesos). And the ones in the stores were between$80 and $150 a bag) . Pro-tip — Always negotiate with the endless locals who sell on the street and even those who sell in the artisan stores. They will try to sell you hats, jewelry, fake Cuban cigars or a beverage of your choice. They expect you to haggle and you will almost always get a better price. Pro-tip- To do the full the shopping circuit, I would recommend starting at the Hotel Charleston and ending up at the Sofitel Santa Clara. This route will allow you to see everything. Pro-tip: Be mindful of the dirt factor on the bags being sold on the street. Sniff them before you buy. I found that many of the ones I bought smelled and I had to shampoo them clean at the hotel. Pro-tip: Some of the best stores were Sylvia Tcherassi for unique and one of a kind stylish clothing, bags and jewerlry, (think Stella McCartney), Vicky Tcherassi (no relation) for fun clothing and shoes (think Alice and Olivia), St Dom for many designer digs (think Colette in Paris), John Seben for unique high quality men’s clothes (think Ted Baker), Patricia Ramirez for swimwear (think Calypso St Barth). 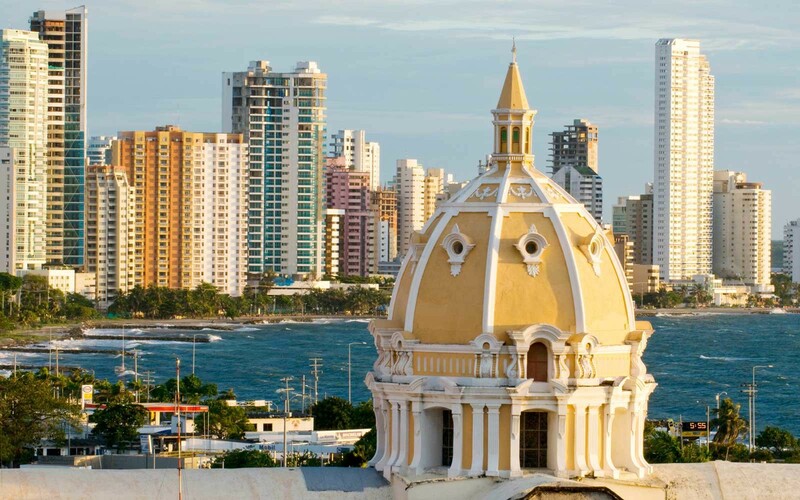 In the daytime — — go to Rosario Islands and Baru- The number one must do in Cartagena. If you want a true romantic and extravagant journey, you must get your own boat from a company like Boating Cartagena. They can arrange for you to go on a smaller speedboat or a luxury yacht. 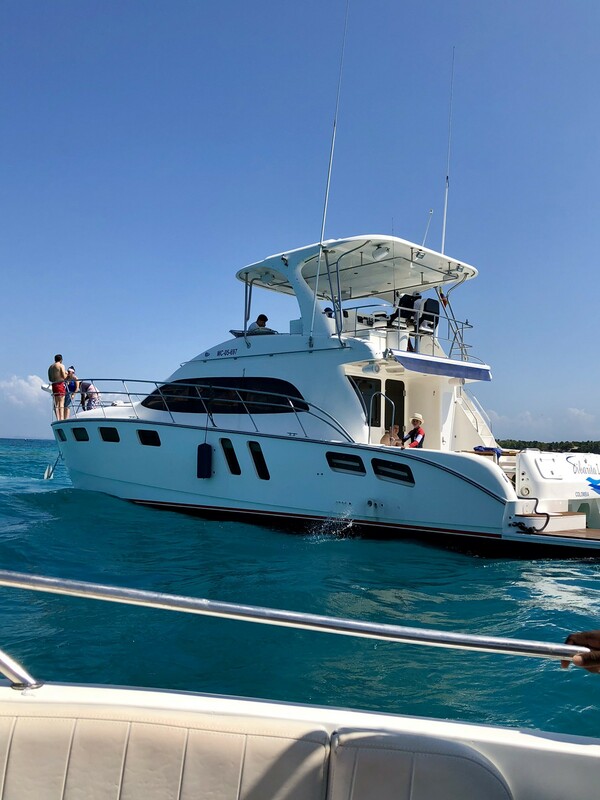 You have your own captain and first mate as well as snorkel gear, wine and goodies for the day. And you can be specific on where you want to go or let them plan it for you. Pro-tip: You must go to Cholon and eat with the locals. This was our favorite part of the day. 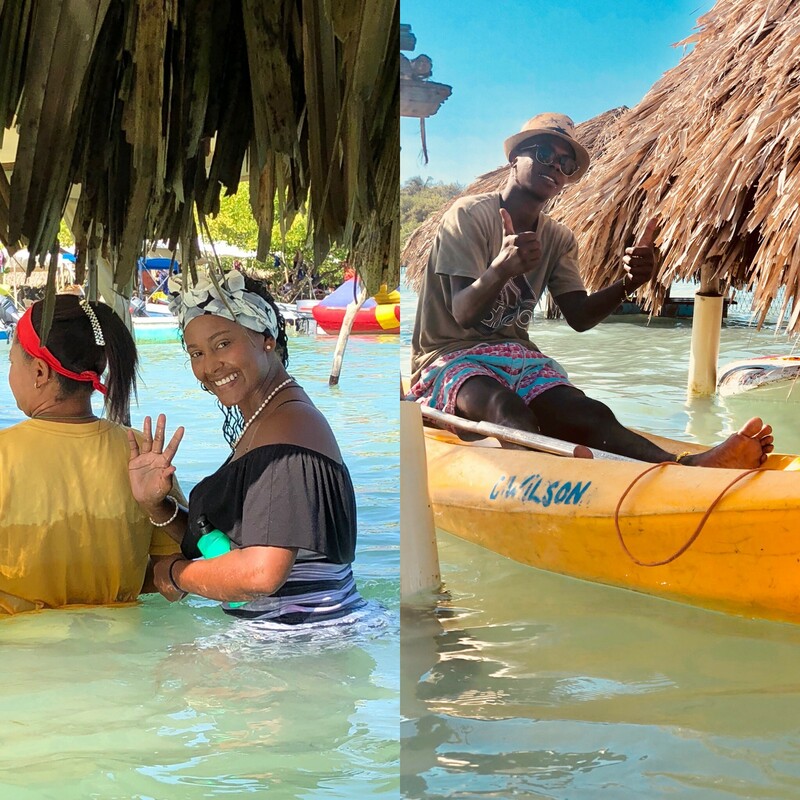 We docked our boat, a “waiter” comes over, takes your fish order, they cook it for you right then and there and then you get off your boat, go into the water under a thatched hut and eat the meal with little guppies nipping at your legs. Pro-tip- if your Spanish is rusty, ask for an English guide in advance. 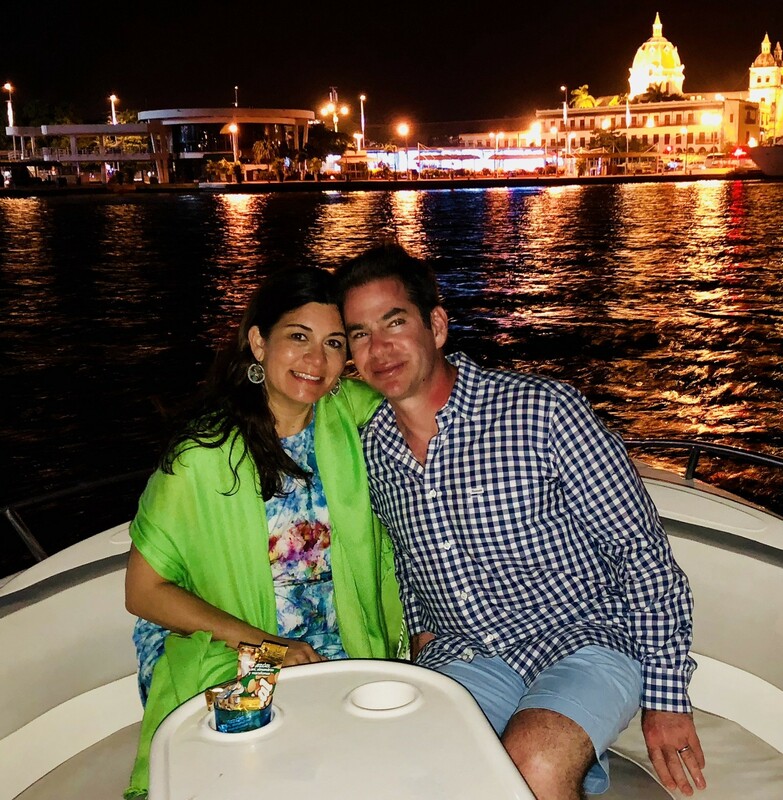 At night — go on a Sunset Boat cruise- If you want some special and romantic time with your honey, book a sunset cruise through Boats4U. You meet them at 5pm, right before the sun goes down and they take you out in the water for sunset. 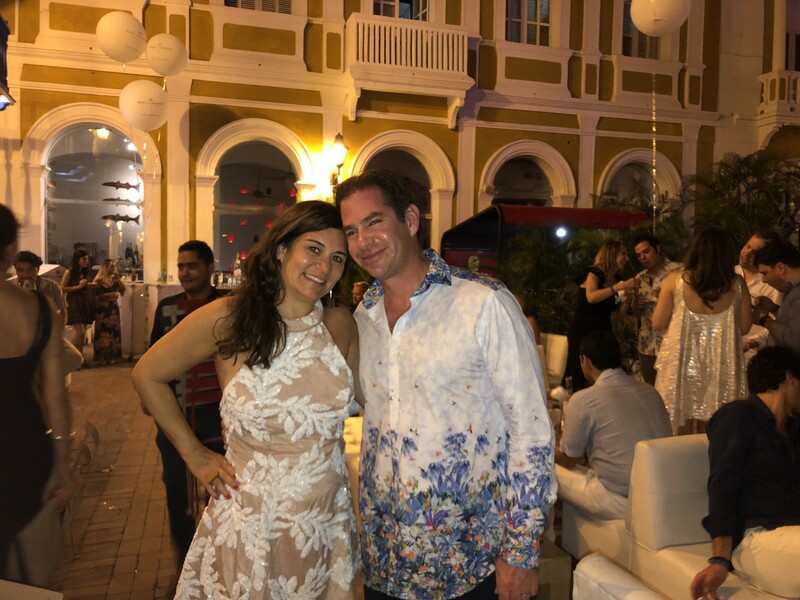 Then, they pop the cork off the champagne that comes with it and tour you around the waters so you can see the magicial city of Cartagena illuminating before your very eyes. We managed to get in some very special and romantic moments. Getsamani street art tour. We went by bicycle with a guide and a guard and we loved seeing all the art and learning more about the Walled city from our guide. The tour was 3 hours and a lot of fun. Pro-tip: Go around Sunset, so you can see all the lights sparkling in the city as well as see the various artist/performers come out onto the squares. If you or your SO have ever wanted to try kiting, Cartagena is a great place to try it. 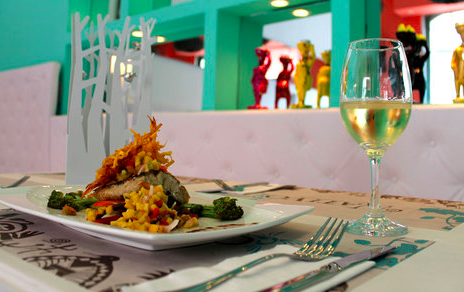 There are 2 main places to try it, La Boquilla and Manzanilla del Mar. Both are a reasonable distance from the Walled City, the wind is great and the surfers are out in full force. 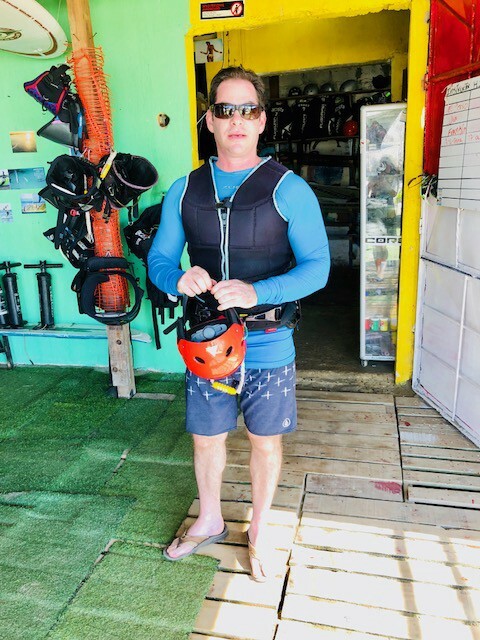 Pro-tip: Kiting in La Boquilla, you must contact En Colombia Kite Surfing where Alex Bustamente runs the school and gives you excellent tutelage as well as a great workout. 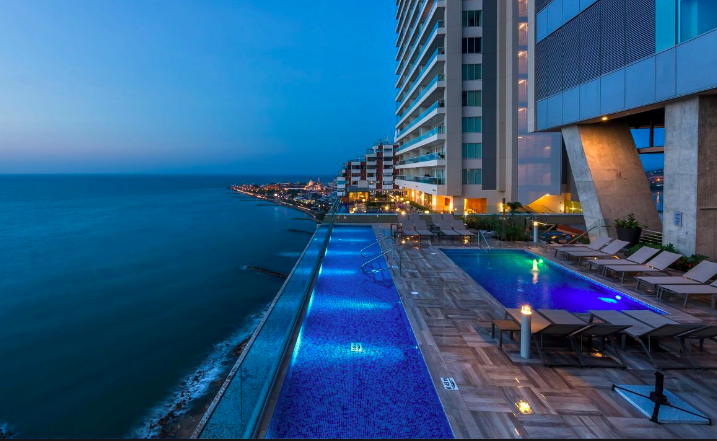 Your honey can come with you and sit at the Sonesta hotel pool while you are out on the sea or come to the beach and root you on. Pro-tip: Kiting in Manzanilla del Mar, a little further from town but just as beautiful. Here, you will find a more rustic experience where Pure Kitesurf is operated by Christina Varvenis. You can do this on your own while your husband or wife is having their own “Me” time or you can head out there together and catch the waves. A special and romantic activity for the two of you to share is a tasting some rum and savoring on some Colombian chocolate. 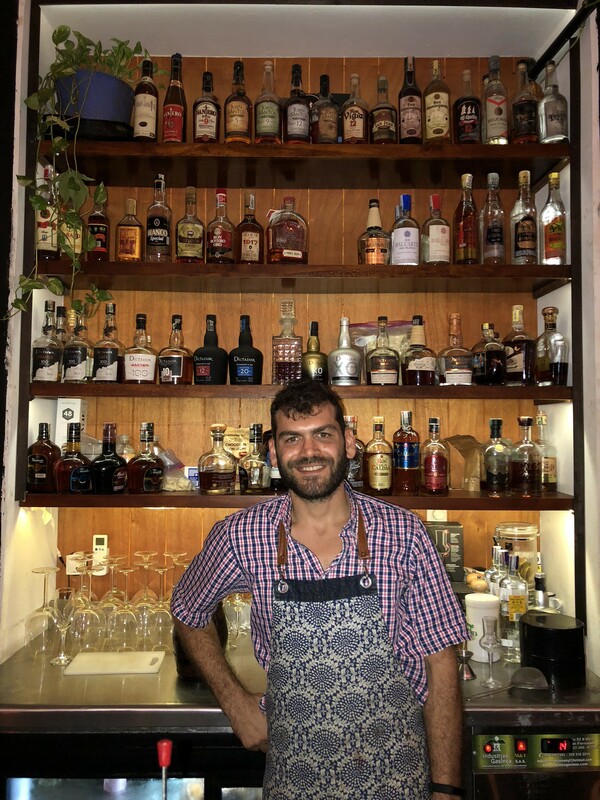 Hi Cartagena will book this unique experience for you and you will spend 2 hours with the rum master, Abraham at El Arsenal, The Rum Box. Here you will taste endless unique and special rums as shooters and sippers, get a true education on the history of rum and leave feeling tipsy, satiated and ready for another romantic evening in Carta. 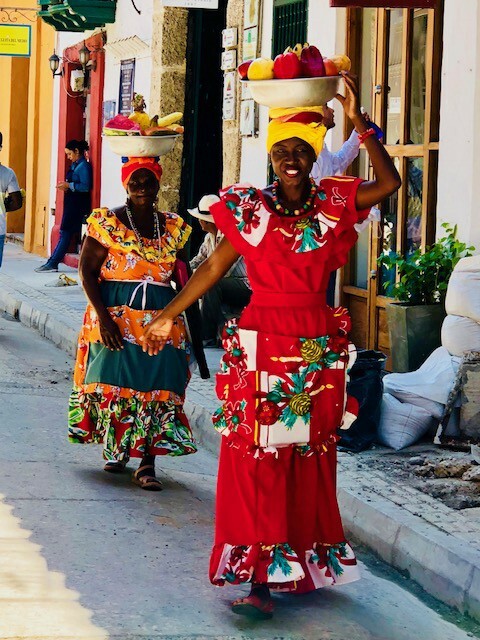 What other places and experiences in Cartagena felt romantic for you? Samantha Daniels is a well-known Romance, Dating and Relationship expert. She is also a Professional Matchmaker and the founder of the dating app, The Dating Lounge. She is the author of Matchbook:The Diary Of A Modern-Day Matchmaker (Simon & Schuster) as well as the creator of Miss Match, the NBC/Darren Star TV show that was based on her life story: Alicia Silverstone played her character. She is a frequently relied upon expert, and is seen regularly on-Television, on the Radio and in national newspapers and magazines. She is a social influencer in the dating, relationship and romance space with a strong social media presence across many platforms.